Lionel Messi (centre) may just be in his element in this match and could well grab a brace. Lionel Messi can grab a brace when Barcelona host Manchester United and over in Porto we may get a real slow-burner as Liverpool manage their lead, says Jamie Pachecho. "Of course wanting to and doing so are two very different things but then again, there’s only one Messi. He’s not as vocal as Cristiano Ronaldo is about stats and records but he’s just as keen on all that stuff and will be eyeing up goals here. You can get 4/7 on Messi scoring but you can also get 13/5 on him scoring two or more." Last time out I was right about Barcelona beating Man Utd but just wrong that though our man Luis Suarez (the second part of the double) was involved in the goal, it was credited as an own goal to Luke Shaw. And this away match will be the toughest game of the likeable Norwegian's at the club yet. It could be one of those games where the visitors are chasing the ball for much of the game and the players may cut some pretty frustrated figures by the end of it. United had just 34% of possession in that first leg and this might be even worse. Add to that the fact that only Marcus Rashford is really in any sort of form from among Utd's attackers and I think 'no' on 'both teams to score' looks a good bet because the hosts could very easily keep a clean sheet here. 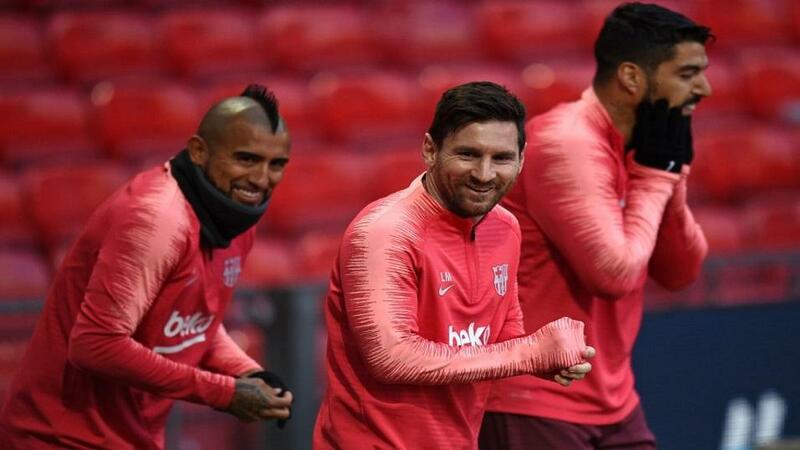 As for Barcelona, they'll enjoy themselves here more than you'd expect, given it's a tough quarter-final match and my money is on 'you know who' being the one doing the damage. Lionel Messi had a very quiet evening in Manchester by his standards last week and he'll be wanting to rectify that. Of course wanting to and doing so are two very different things but then again, there's only one Messi. He's not as vocal as Cristiano Ronaldo is about stats and records but he's just as keen on all that stuff and will be eyeing up goals here. You can get 4/7 on Messi scoring but you can also get 13/5 on him scoring two or more. In the last seven matches in which he scored, on four occasions he got two or more - two hat-tricks and two braces- and that looks the more attractive option to me. The double comes to 9.47. Now, I appreciate that Man City v Tottenham is in many ways the bigger game on Wednesday night in the Champions League but I think City will somehow manage to go through. It's anyone's guess to how they will do so and, in terms of goalscorers or other markets, there's not much there in terms of value bets so I'd rather look at this game. This match will go very much go the same way the second leg did last season with Liverpool having done all the hard work in the first leg and then cruising in the return one. Last time it was 5-0 in Porto and 0-0 at Anfield, this time it was 2-0 in Liverpool and think we may have a similar scoreline this time round. How the Reds have really changed (some might say improved) is in how they can play different ways this year and that 0-0 at home to Bayern Munich was a good example of that. They're far more pragmatic this season and the way I see the game pan out, is that they soak up pressure and try to catch them on the break with their pacy forwards should the situation arise. This could be a real slow burner with Liverpool happy to invite Porto to take the risks and it's likely to be a draw at half-time, almost certainly 0-0 but 1-1 would just about do us, as well. The half-time stalemate is 6/5. Just about because the second part of the bet is that there are less than 2.5 goals in the game. It may be that in the second half the visitors score one on the break, Porto get one to create a nervy finish and I wouldn't even be that shocked if it just ended 0-0 once again but you can have all those options on your side by backing less than 2.5 goals at 4/5. The double comes to odds of 3.23.